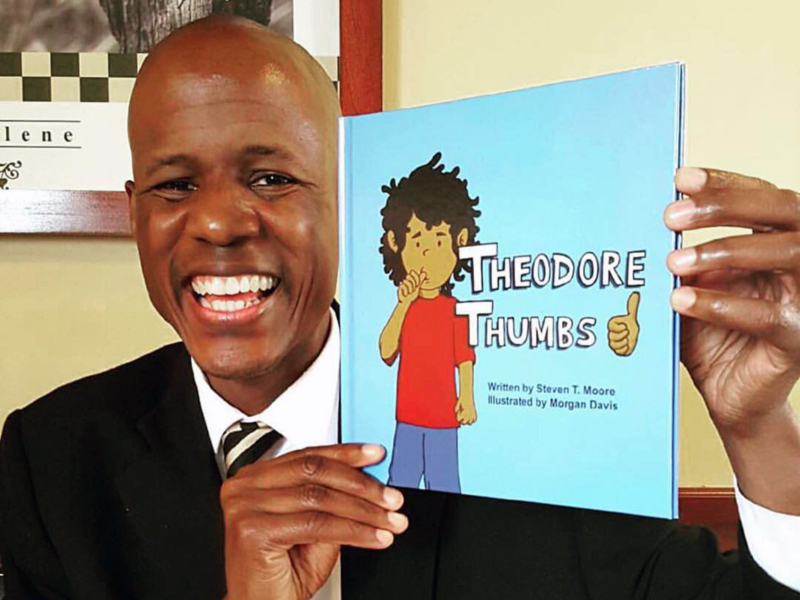 Dr. Steven Moore has written a children's book on bullying titled "Theodore Thumbs." Dr. Steven Moore shows many facets of his personality, whether he’s leading singing in Chapel, having coffee with students in the campus center, or teaching poetry classes. He recently revealed another side of his personality: a child who sucked his thumb. Moore, associate professor in the Department of Language and Literature and director of the McNair Scholars Program, has published a children’s book titled Theodore Thumbs. It tells the tale of a little boy who gets bullied, but finds comfort in sucking his thumb. While the story is not a true biography, Moore was inspired by his own life experiences dealing with bullying and racism at a young age. Moore grew up in a military family so he was constantly moving to new schools, churches and cultures. When he faced racism, Moore’s parents taught him to cope through love and forgiveness. As an adult, he explored his emotions through poetry rather than dwelling on bitterness. Although Moore has taught all levels of English from freshman to graduate courses, he became most known on the ACU campus for a song he taught in Chapel. “Highways and Byways” involves hand motions for every lyric, and when Moore first taught the song he wasn’t sure how students would respond. They responded with great enthusiasm, and Moore now receives frequent requests to lead the song. Fifteen years after he first taught the song, students still cheer when Moore steps up to the stage and sings the song’s opening notes. Moore said alumni have sent him videos of children singing the song from Africa, Brazil, England and from several states across the United States. But Moore’s influence on campus doesn’t stop there. He is also director of ACU’s McNair Scholars Program, a federally funded program designed to help prepare participants for doctoral studies through involvement in research and other scholarly activities. Moore fights for those who are oppressed or disenfranchised in our world through his work with McNair and each day in the classroom as he approaches these subjects and more through literature and writing. He teaches an honors colloquium called Bon Appetit: Savoring Poetry & Good Cooking, which combines literature and eating out at restaurants in order to bring people together. Theodore Thumbs, illustrated by alumnus Morgan Davis, is available for purchase from Clear Fork Publishing, from Amazon and from Barnes and Noble.